Don't Eat the Paste: Japanese Seed Beads FTW! Believe it or not, that's a color photo. 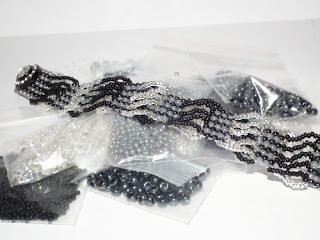 Auntie's Beads sent me a wonderful selection of black and white themed seed beads. EDIT: Just finished instructions, which you can find here. the rounder shape of seed beads works a lot better than cylinder beads. I use the larger sizes in seed bead designs like the bracelet above, which is made with size 8 gunmetal, size 8 silver gray ceylon and size 11 matte black and crystal. I also use the larger sizes a lot in thread crocheted amigurumi dolls. They work perfectly for eyes and small details. I think my favorite thing about them is the range of colors and the consistency of them. 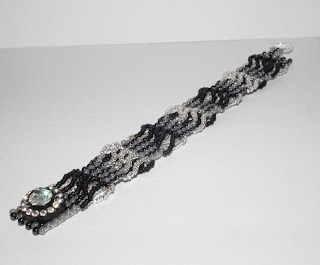 I'll be posting instructions for the bracelet on beadwork at BellaOnline after I get it all diagrammed. My husband thinks the technique would work very well for USA flag bracelets so I'll graph one. I think this bracelet design would also work very well using seed bead mixes, and Auntie's Beads has some lovely color themed mixes available on their seed beads page. The button clasp came from my personal button collection. Gorgeous bracelet Shala! What stitch is that? I'm going to edit the post now with a link, but it's odd count peyote, I just finished writing instructions.